Reading and share top 6 famous quotes and sayings about Piglet And Pooh by famous authors and people. Browse top 6 famous quotes and sayings about Piglet And Pooh by most favorite authors. 1. "Later on, when they had all said "Good-bye" and "Thank-you" to Christopher Robin, Pooh and Piglet walked home thoughtfully together in the golden evening, and for a long time they were silent. 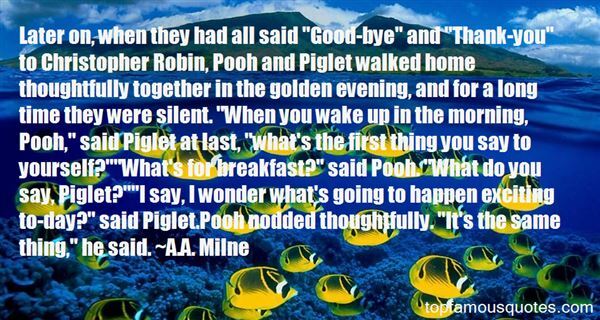 "When you wake up in the morning, Pooh," said Piglet at last, "what's the first thing you say to yourself? ""What's for breakfast?" said Pooh. "What do you say, Piglet? ""I say, I wonder what's going to happen exciting to-day?" said Piglet.Pooh nodded thoughtfully. "It's the same thing," he said." 2. "It's a little Anxious," Piglet said to himself, "to be aVery Small Animal Entirely Surrounded by Water. ChristopherRobin and Pooh could escape by Climbing Trees, and Kanga couldescape by Jumping, and Rabbit could escape by Burrowing, andOwl could escape by Flying, and Eeyore could escape by -- byMaking a Loud Noise Until Rescued, and here am I, surrounded bywater and I can't do anything." 3. "Do you know what A means, little Piglet?" "No, Eeyore, I don't." 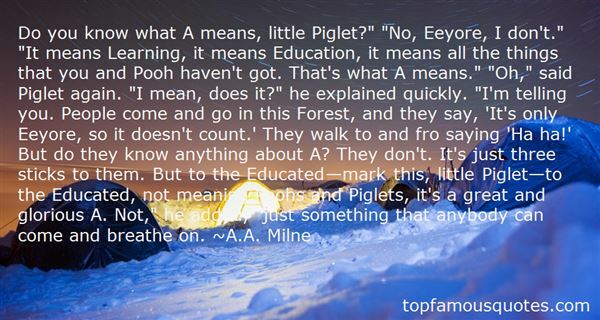 "It means Learning, it means Education, it means all the things that you and Pooh haven't got. That's what A means." "Oh," said Piglet again. "I mean, does it?" he explained quickly. "I'm telling you. People come and go in this Forest, and they say, ‘It's only Eeyore, so it doesn't count.' They walk to and fro saying ‘Ha ha!' But do they know anything about A? They don't. It's just three sticks to them. But to the Educated—mark this, little Piglet—to the Educated, not meaning Poohs and Piglets, it's a great and glorious A. Not," he added, "just something that anybody can come and breathe on." 4. "Rabbit's clever," said Pooh thoughtfully. "Yes," said Piglet, "Rabbit's clever. ""And he has Brain. ""Yes," said Piglet, "Rabbit has Brain. "There was a long silence. "I suppose," said Pooh, "that that's why he never understands anything." 5. "While Eeyore frets ... ... and Piglet hesitates... and Rabbit calculates ... and Owl pontificates...Pooh just is." 6. 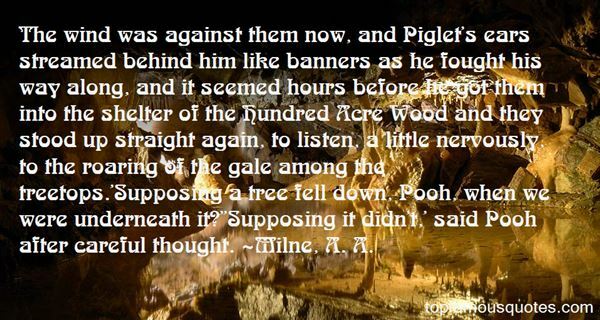 "The wind was against them now, and Piglet's ears streamed behind him like banners as he fought his way along, and it seemed hours before he got them into the shelter of the Hundred Acre Wood and they stood up straight again, to listen, a little nervously, to the roaring of the gale among the treetops. 'Supposing a tree fell down, Pooh, when we were underneath it? ''Supposing it didn't,' said Pooh after careful thought."